Cheap and quick motorcycle shipping services - Is it worth? How much does it cost? How long does it take? Are you a motorbike lover and planning on to relocate to Australia? Or maybe you have just planned the holiday of your live and want to ride your bike in OZ for a few months? We are the right people that will delivery your bike to anywhere in Australia. bike creating, customs clearance, packing, door to door delivery. Before you initiate the overseas shipping of your motorbike make sure that you have pressure washed underside, fairings, wheels, side covers, and wheel and mud guards. Properly clean your engine bay especially, remove water from anywhere apart from the radiator but please make sure it is free of any dirt. Off course we can arrange this for you. When sending a motorcycle from the UK to OZ the same procedures and requirements must be met as when shipping a car. Please read our guideline to find out more info. If you would like us to ship your motorbike, classic Vespa or Lambretta scooter to Australia please contact us for a free estimate. We will be happy to help. If you are also looking for shipping goods we will build up a timber frame around and above the motorbike and use the free space to save you money. The free space can be used by you or we will offer it to our other clients so you actually pay just for the space you use. Transport of motorcycles from the UK to Australia is not as complicated as many people think. However there are a few things you should bear in mind. You need to follow some international motorbike shipping procedures, possess the right documents and fill out a few forms. There are also some motorbike shipping charges involved but we will talk about this late, even give you some ideas of how much it may be. First of all you need to check if you are allowed to take your motorbike to OZ. Some bikes are not approved be Australian Road Transport Agency. However there is no issue that can't be resolved. A few simple modifications to your bike and you will be eligible to ship it. Bringing a motorcycle from the UK can be a way to buy a good machine at a lower price. The total price should include the bike collection and delivery costs. If you want to organize everything by yourself you may find the whole import procedure quite complex. So if you are shipping the motorcycle just for your personal use and it is going to be just one off shipment you should use professional motorbike movers. You have two options. If you are relocating from the UK to Australia for good and you have owned a motorbike for at least 1 year you it can be shipped under personal import scheme. If that's the case you may get away with paying the customs duties. The other option is you can buy a new or used motorbike and ship it. However it will be classed as a commercial shipment and you will have to pay some taxes. In some cases you may not be given the permit to ship the bike and you will have to use a third party company to be able to ship it. Before you decide to buy a motorcycle in the UK and import it to Australia it is worth finding out what's involved and how to organize the transport. 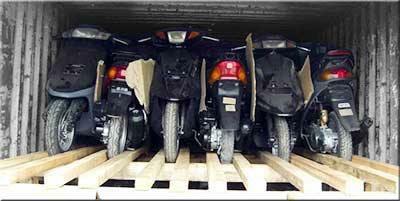 Motorbike shipment is only possible while maintaining appropriate export procedures. What documents do I need to transport motorcycles from the UK to Australia? When purchasing a motorcycle in the United Kingdom, make sure to ask the seller about all documents required for the transport and subsequent registration. First of all, you should get a deed from the seller and ownership certificate. This also applies to the purchase of equipment from a bike dealer. You will also need a prove of the purchase. Always ask for an invoice, without it your bike import application will be rejected. Also, the shipping company organizing the delivery of your bike to Australia must issue an invoice for the service. How to bring a motorcycle from the UK to Australia? 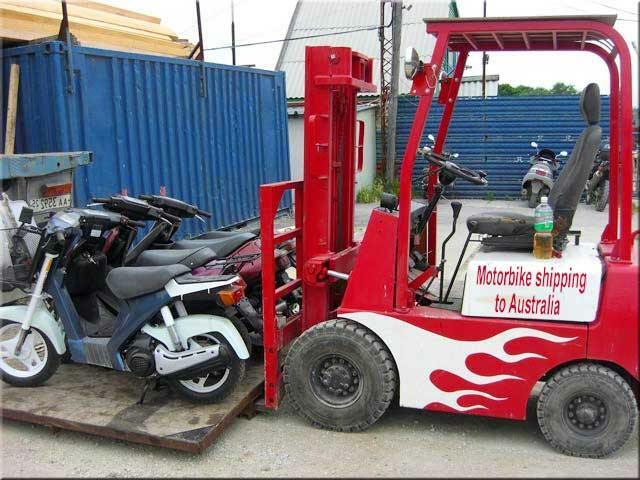 Do you wonder how to ship a motorbike from the UK to Australia? There are only two methods available. The first one is the sea freight which is relatively cheap and if you do want to keep your costs low you should use this way of getting your bike to OZ. How long does it take to ship it? – About 14 weeks door to door. The other option is air freight however it is much more expensive and if you want to make some money on your bike this is not for you. The bike delivery time is much shorter though – just 1 week and you could be enjoying your new motor vehicle. No matter from which port in the UK the bike will be shipped. Your bike movers will take care of the bike collection. It needs a proper packing too. Most bikes are sent in a specially designed wooden cages or crates. They can be also shipped on special holders, strapped to the shipping container handles. There are also other requirements. The motorcycle has to be properly cleaned. If it is shipped in a wooden box it must not contain any oil or petrol. You do not have to worry about this. The bike shippers are very familiar with all procedure and must comply with them. If not they may lose their freight forwarding licence. When choosing a removal company make sure they will take care of everything. There is no point in using another motorbike shipping agent to deal with the customs documents in Australia. However some international moving companies do not offer custom clearance services. But do not worry! You can sort this out yourself and make the shipping of your motorbike a bit cheaper. In the case of self-customs clearance after signing the documents you should go to the Customs Office where the customs duty will be calculated. Once you have paid the tax you can collect the import documents. If you are going to pay later you need to take the payment confirmation. The motorbike will not be released from the Customs Agency custody until the payment has been made and all necessary payment proofs have been provided. The customs formalities, however, do not end the official part concerning the shipping of motorcycles from the UK to Australia. The equipment must be taken for the inspection. Before buying it is worth to make sure that it satisfies the requirements of Australia Road Transport Regulation Agency. Most popular motorbikes shipped by Britons to Australia from UK are: Harley Davidson, Kawasaki, BMW, Victory Judge, Honda, Ducati Monster, Yamaha, Moto Guzzi, Suzuki SVF. 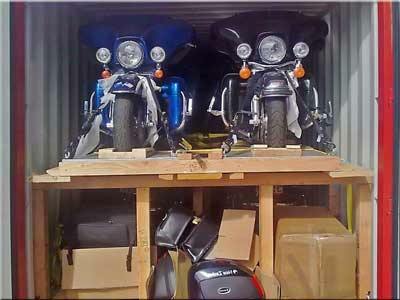 We will help you to find the quickest and the cheapest way of shipping a motorbike to Australia. You probably wonder how the bikes are transported to OZ? How to make them safe and make them secure so they will be delivered without a single scratch. There is quite a few solutions for this problem. We are going to present just one but in our opinion it is the most safe and one of the cheapest method of importing your bike. To make it really cheap you should visit a local carpenter, explain what you need, show him your motorbike and ask to design and build a custom made motorcycle wooden crate. There is one very important thing you need to pay your attention to, namely the type of wood that will be used to build the crate. Make sure your carpenter company is aware of the international import and export bug certification requirements. Using appropriate wood or even better a plywood which was treated in hit to comply with IEBCR will save you any potential problems with Australian Customs.